Harrods, the legendary Knightsbridge department store, has delegated its electronics department to Dixons, the high street electronics chain. Despite its mass market credentials, both companies say that the Dixons outlet, due to open in 2012, will be much more to the taste of the discerning Harrods regular. To this end, it'll be selling some more exclusive, high-ticket-price brands that you won't find at Dixons stores on the high street, like Leica, Bang & Olufsen and Loewe. If it's an 85-inch Plasma TV you're after, Harrods will be the place to be. 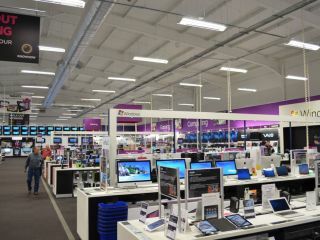 Dixons reckons this is the perfect time to reposition itself as a more up-market brand, with David Lloyd-Seed, Dixons Retail's Group Communications Director, saying, "This gets the message across we have changed as a business and have a different level of customers service and product than you'd associate with the old Currys." However, it remains to be seen whether or not the concession within Harrods will be branded Dixons, Currys, PC World or something classier. While it may be all sweetness and light between Harrods and Dixons now, the department store once sued Dixons for its advertising campaign in 2009, in which Dixons advised customers to visit "the discerning shopper's fave department store" for a product demo then go to Dixons.co.uk to buy it. However, a spokesperson said today, "We are under completely different ownership now. That is all water under the bridge."